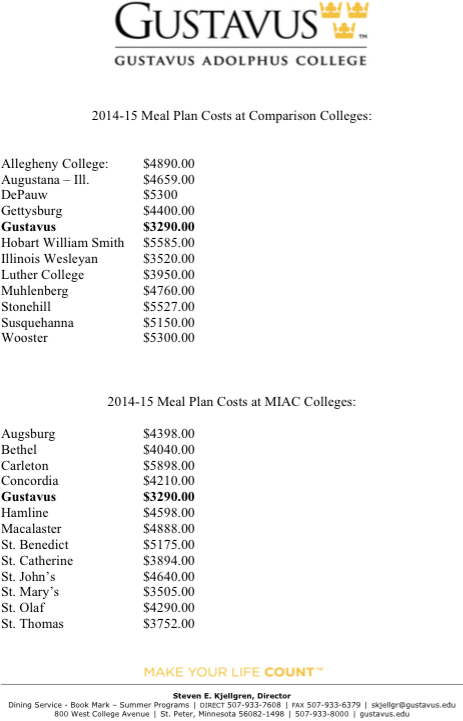 SAINT PETER— Following the publication of price and quality comparisons demonstrating the Gustavus dining service offers the cheapest and best college food in the region, hundreds of Twin Cities food enthusiasts have flocked to campus to enjoy Minnesota’s trendiest eatery. The new customer base for the Gustavus dining facilities was drawn by the mysterious title of the restaurant, as well as its evident superiority to its direct competitors. The initial wave of hip young ‘foodies’ was first drawn to campus following a review in Mpls.St.Paul Magazine ranking the Gustavus cafeteria as “Minnesota’s #2 non-traditional semi-organic multicultural a la carte brasserie.” The Evelyn Young Dining Room fell closely behind perennial St. Paul favorite “Núâncèd Fūderię” a restaurant famous for serving all of its entrees with a portrait of Allen Ginsberg and a tube of hair pomade rendered from the hooves of locally-slaughtered yak. Within hours of the publication’s release, the number of Doc Martens in Saint Peter rose 3,000%. 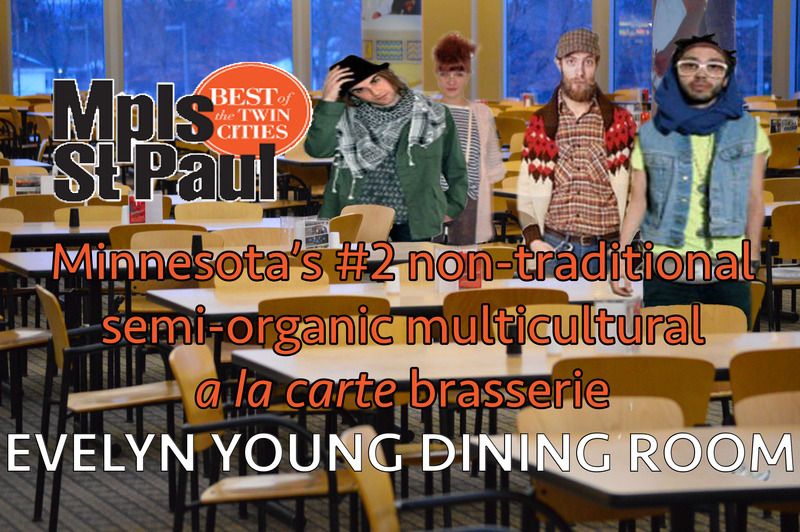 The Evelyn Young Dining Room was named the #2 non-traditional semi-organic multicultural a la carte brasserie in the state by Mpls.St.Paul Magazine. Dining Service Director Steve Kjellgren views the cafeteria’s newfound popularity as a mostly positive turn of events. “While the skinny-jeans-and-flannel clientele has not traditionally been our specialty, they are generally welcome in our facilities.” Kjellgren went on to claim he “could do without the daily bulk shipments of seitan and tofu,” and expressed his wish the new, hip visitors to campus “would stop snickering at the apparel in the Bookmark and calling it ‘ironic.’” He also noted that the lost and found now mainly consists of cashmere scarves and wool beanies. A further troubling development in the rise in popularity of the Gustavus Dining Service is the trendy usage of Gustieware as fashionable storage containers for jewelry, tobacco paraphernalia, and luxury writing utensils.